Fans of African football the world over will be rubbing their hands in anticipation ahead of this year's Africa Cup of Nations, which will be held in South Africa between 19/01/13-10/02/13. Sixteen teams will take part, and there are one or two others which are notable by their absence, among them Egypt, South Africa (neither of whom qualified for last year's tournament), Cameroon, Sudan, Guinea and both co-hosts from the 2012 tournament, Gabon and Equatorial Guinea; also missing after competing last time out are Libya and Botswana. Back for the first time since 1982 are Ethiopia, who won the competition in 1962, and Cape Verde, who have been making rapid progress and knocking on the door of qualification for a major tournament for some years now, finally made it to the final stages of international competition after dramatically defeating Cameroon in the final play-off round of qualifying matches. Two teams made it through in dramatic circumstances; Burkina Faso defeated the Central African Republic 3:2 on aggregate thanks to a goal in the seventh minute of second-half injury-time from Alain Traoré, while the winners of last year's tournament, Zambia, only just squeaked through against Uganda 9:8 on penalties after each team had won their respective home game 1:0. The CAR, who had never previously come close to qualifying for the final stages of any major tournament, appealed to the CAF to have the second-leg replayed, claiming that the injury-time was excessive, but to no avail; Uganda, meanwhile, have, like Cape Verde, been making good progress in recent years and can count themselves unlucky to have been eliminated. Will the CAR ever have a better chance of making it through to the final stages of either major international tournament? Who will finish top of the tree this time round? Côte d'Ivoire and Ghana have to be considered as being the front-runners with Nigeria also well and truly in the hunt, whilst Zambia will struggle to repeat their heroics of twelve months ago and hosts South Africa (without Steven Pienaar, amongst others) have selected a youthful squad and will find it difficult to progress past the quarter-finals. Morocco, inconsistent as they are, could well spring a surprise; as usual, Tunisia will prove difficult opponents and could well go far. Please see below the draw and fixture-list for the 2013 Africa Cup of Nations. NOTE: As last time out, the Africa Cup of Nations can be seen on Eurosport in those areas covered by the network across the globe; most of the games are advertised as being live on (British) Eurosport, together with highlights and the occasional game on (British) Eurosport 2. This will also ensure that Australian football fans will enjoy live coverage of the tournament. British television network ITV4 will be showing around twenty of the games live, with all matches apparently being simulcast on the ITV football website. No Irish TV stations are covering the tournament. ESPN will be broadcasting coverage of every match (live or delayed) from the 2012 Africa Cup of Nations; most will be shown on ESPN3, with both semi-finals and the final also being shown on ESPN Deportes. All kick-off times shown above are under local time. If you, dear reader, have ever heard of the tiny Channel Island of Sark, you will have doubtless read the articles and seen the TV travel programmes, and discovered that the island contains the following (or so you might think): no cars, no street lighting, a feudal system headed by a Seigneur (Sark's hereditary ruler), and the "Worst Team in World Football." Time to get rid of some of the stereotypes. Fair enough, no cars are allowed on Sark, motorised transport is rare, and the only way to access the island is by boat from Guernsey. There are a fair number of tractors on the island, though. What more do you really need on an island with an area of 2.5 square miles and a population of around 600 people? A race-track? No cars, no street-lighting. No problem. As for the political side of things on Sark, the island is no longer "feudal", but has had its own fully democratically-elected assembly since 2008, which came about after the Barclay brothers, erstwhile owners of the Daily Telegraph and The Scotsman, current owners of the neighbouring island of Brecqhou - which falls under Sark's jurisdiction - and seemingly not the most popular set of twins on Sark, objected to the statutory right for the first-born son of a Sarkee (the name used to describe those living on the island) to inherit his father's property as they wanted to split it between their four children, and stomped off to the European Court of Human Rights, who found in their favour. Sark was, and remains, a Crown Dependency of the United Kingdom, which comes under the Bailiwick of Guernsey and is therefore not part of the European Union. Now that most of the stereotypes have been dealt with (and its probably for the best that any discussion over the island's politics be left to others), it's finally time to ditch the travelogue and all the rest, and concentrate on the footballing side of things on Sark, which will eventually bring us to the fourth and final stereotype, but not just yet. Football on Sark has, in comparison with the three larger Channel Islands - Jersey, Guernsey and Alderney - been a fairly recent addition to the island's sporting calendar, with matches taking place on the island only since the early 1950s. Most of the games were friendlies between local lads and seasonal staff from the hotels on the island, though there were also occasional friendlies against teams from visiting vessels. There was no designated football pitch on Sark, so players from both teams had to make do with a converted field at the back of a pub and use the bar as their dressing-room. According to Chris Drillot, a native of Guernsey - who came to the island in 2000 - and football enthousiast, Sark's sporting life took a turn for the better when, in November 2000, three men met in a local pub and decided to create a sports club, first starting with the existing cricket club, and then expanding to bring football and rugby under the umbrella of the sports club. The football arm of Sark SC was officially founded in early 2001, and, under the name of Sark Football Club, celebrated its 10th year in existence in 2011. Archery, bowls, hockey and touch rugby are now also part of what Sark Sports Club has to offer. Sark FC applied to join the Guernsey FA, and its application was accepted in 2002. "We joined with the Guernsey FA to expand and be allowed to play in their minor tournaments," said Drillot. "We [took part for] three years in the GFA Cup and played once in an over-40s five-a-side competition." The 2003 edition of the Island Games was to be held in Guernsey, and Sark's football fraternity decided to enter the competition, thus, unknowingly, cementing their place in the hearts of football statisticians the world over and kick-starting stereotype number four into the bargain. Chris Drillot was of the opinion that the "Island Games was the best thing Sark FC has entered; we decided to do it because it was in Guernsey and we had a good, committed, band of players." However, committed as they were, some of them still had other problems to overcome. "In the end, we struggled to get a squad of 20 together; some were local lads living or schooling in England so we did not see some of them until the week of the tournament. The core of twelve [locals living on Sark itself] trained twice a week in the winter, with very limited facilities." Drillot was one of them, and, during the week, assisted on the coaching side as well, alongside Barry Dewsberry. Two Guernseyans, Shane Moon and Steve Angel, came over on the boat from St. Peter Port to help coach the team at weekends. Moon was eventually to take the role of team-manager. The Sark team played several friendlies in the run-up to the Island Games, and although the side were regarded by one and all as the tournament's rank outsiders, the players were still determined to enjoy themselves. Drillot explains: "We were given no chance from the start but we did not care - the experience was the key and to enjoy it." "The media jumped on our side and followed us [from start to finish]. We had great support and never gave up. We did underestimate how tough the tournament [was going to be] and after the first game the depleted squad was not fit and strong enough." Sark's history-making first game in the 2003 Island Games tournament was against Gibraltar, and took place on 29/6/03 at the Blanche Pierre Lane ground in St. Martin. Unfortunately, it was a desperately unhappy experience for the Sarkees; after conceding 13 goals in the first-half, they leaked another six in the second-half. Sark's lack of experience and preparation ultimately told. Drillot continued: "Every one who put on a Sark shirt gave 100%, even if they were only 30% fit. For the last two games, Shane did not pick a team; he just positioned the 11 that were not injured." 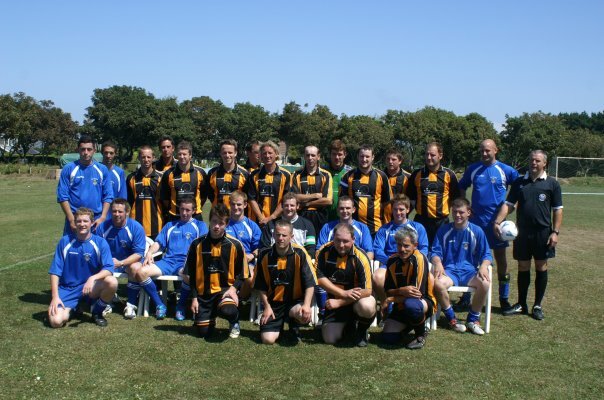 The team's second match, which took place a day later at the same venue, saw a total of 20 goals scored, though, sadly, none of them were scored by Sark, but by the team which went on to finish the tournament in fourth place - the Isle of Wight. Ten different players scored for the Isle of Wight that day. Sark's final group game took place on 1/7/03, and it was to end in yet another heavy defeat, this time by 16:0 to Greenland. Two days later, their tournament came to an end at Alderney's Arsenal Ground, when they faced the Norwegian island of Frøya. Unfortunately, it was a case of "more of the same" for the team in gold and black; they were on the wrong end of a 15:0 thrashing. Despite the team losing all four of its matches at the Island Games, conceding 70 goals while failing to score once themselves, the experience, according to Drillot, left an indelible mark on those who represented the island: "It [the Sark team's participation in the tournament] is still talked about by the ones who went and we will not say never again." The Sark side finished the tournament in last place in their first foray into international football, and had, in the space of a week, earned the unfortunate moniker of "the world's worst football team," which was more than a tad unjust. Mind you, many teams seem to share, and have shared, this rather cheaply thrown-about title, such as San Marino, Luxembourg, Palau, American Samoa, Montserrat, Djibouti and any number of club teams, so it was hardly likely that anyone on Sark would have lost any sleep over this. Sark FC left the Guernsey FA in 2005, due to a GFA rule stating that players could only play for one registered team. Sark FC, according to Drillot, relies "on players from other teams to make up the numbers." This was not the only reason for the Sark team's departure, but certainly the most important; the GFA, Drillot added, are now directly affilliated to the Football Association, which introduced a child welfare law which stipulated that all matches featuring under-age teams be monitored by a child-welfare officer. Sark FC have gone it alone ever since, though the GFA door has been left open should the team reconsider; in fact, Sark FC competed in the GFA Cup until 2007. 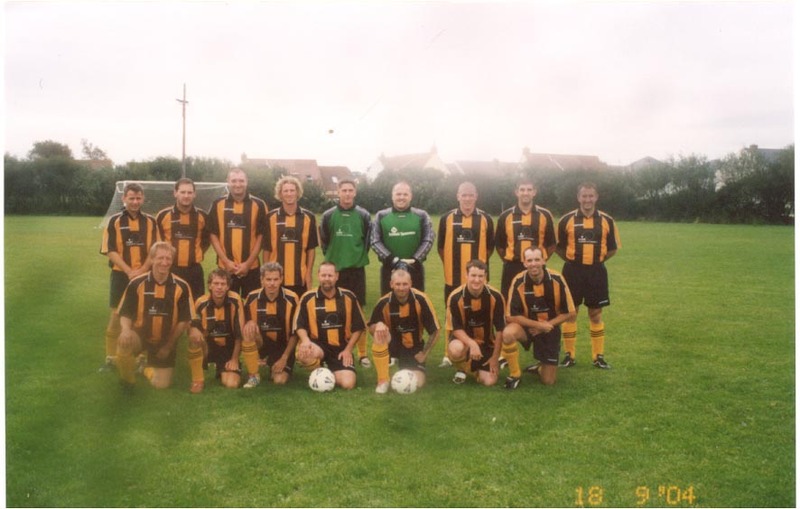 The same year, a new community centre was built on Sark, and the sports club took on the adjacent fields, creating a cricket field and multi-purpose pitch for the use of the club's football, hockey and rugby sides. Sark FC has expressed an interest in competing in the annual Muratti Vase competition (as Sark, not as Sark FC), a tournament currently involving the three largest Channel islands - Jersey, Guernsey and Alderney - with a view to playing against Alderney in a preliminary round, but Guernsey were not supportive of changing the competition's format. This involves either Jersey or Guernsey playing Alderney in a preliminary match and the other island getting a bye to the Muratti Vase final. Any possibility of Sark being involved in the Muratti has been nullified, at least for the time being. However, the local team still plays friendlies on a fairly regular basis, and there has been the occasional bit of internet forum chatter about the possibility of Sark taking on their near-neighbours Herm, either in the Muratti or in friendlies; Drillot told Pat's Football Blog early last year that they would love to take on their nearest of near-neighbours, who themselves formed their own team in 2010 and promptly joined the GFA, though the Herm team seem to have dropped off the radar in the last year or so. Chris Drillot, who has played in just about every position for Sark FC as well as, at one time or another, assuming a coaching, secretarial or presidential role since the team's creation, still plays and occasionally referees. He has been club secretary since 2010, is the club's current chairman and is one of a quartet running the club; fellow committee members Neil Williams and Gary Hamon also play for as well as take care of managing the team whilst, last but not least, midfielder Dean Southern also sits on the committee. Drillot is certainly positive about the future of the team, even if the pool of potential players available on the island is rather small: "The future looks good, with a young committee coming through and a good local squad..Every year, we pick up [seasonal staff from the island's businesses] to support the few locals we have." Head team manager Williams shares Drillot's optimism, praising his players and appauding the enthusiasm of Sark's youngsters. "I feel we're going in the right direction. We now have a proper sponsor and new equipment which is always nice to have, all the youngsters are always keen to play and train when they're on school holidays and we always pick up a few players who are working on the island in the summer. We had a good first season under myself and the new sponsor which was nice as we haven't had the best results in the past. Everyone pulls together on the pitch when it matters which is always good to see." Certainly, judging by recent results, Sark Football Club is showing encouraging signs of improvement. 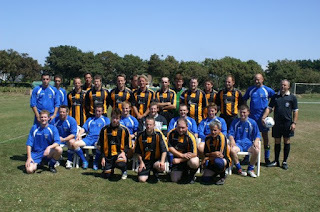 Whether the club - and Sarkees living outside the island - manage to send a team to Bermuda to represent Sark at next year's Island Games tournament is open to question, with distance and cost being two large stumbling-blocks, but the chance of taking part - and getting a couple of good results - in the 2015 version, which is due to be held in nearby Jersey, will surely be too good to pass up. It would be good to see the men in gold and black back on the international stage and get rid of the rather unjustified "worst football team in the world" tag once and for all. Kindly note that the below squad-list contains a number of players known only by their first name or nickname. Also, several players have played for Sark FC in more than one position and/or have no specified position as such; they appear more than once in the list. AUTHOR'S NOTE: Many thanks to Sark FC secretary Chris Drillot for his gargantuan contribution to this article (and especially for his patience! ), and also to team manager Neil Williams for his input. Paul Mooney (Guernsey FA), Brian Garrard (Sark government) and Bob Parsons (Sark Scribe newspaper) also deserve an honourable mention. As ever, any errors/omissions shall gladly be corrected once they have been pointed out. The second-smallest of the main inhabited Channel Islands, Sark, has been the subject of much curiosity from football fans both on and off the internet in recent years, whether it has been caused by the history of the game on the island, the island's representative team dipping its toes in international action by way of its participation in the 2003 Island Games, or the travails of Sark Football Club, which was founded in 2001. There is no complete list of results of games involving Sark Football Club - as opposed to the Sark representative side which took part in the Island Games - or its unofficial predecessors, but, with a lot of help from Sark FC club secretary Chris Drillot, Pat's Football Blog is able to provide a list of results which could be regarded as being reasonably, if not absolutely, comprehensive. Hence, the word "a" is used in the title instead of "the." Sark FC's goalscorers are listed where possible; some are listed by first name or nickname only and is, admittedly, incomplete. That is at least in part due to the transient nature of life on Sark, at least as far as work is concerned. Sark FC play only occasionally, and a number of workers at one of the island's tourist establishments play perhaps once for the team before departing the island. To quote Chris Drillot: "We [Sark] have a lot of workers who come and go, and we only find out their first name or nickname." Please note that not all of the scorers, dates or venues are listed. AUTHOR'S NOTE: Many thanks to Chris Drillot for his help in compiling the list and for granting permission to lift some of the above results from Sark FC's Facebook page. (Thanks are also due to Neil Williams for keeping the world and his dog up to date with fixtures, results and scorers on said page.) The other scores were procured from a variety of sources, including the www.sark.info website. If anyone has any further information on the above, kindly get in touch, ditto if there are any errors.